First Contact has become such a well-worn SF scenario that it has a whole entry to itself in The Encyclopedia of Science Fiction. Like any established subgenre that has been on the scene long enough, first contact has come to possess a series of identifiable tropes that serve to distinguish stories from one another, but also place them within the same extended family. There are the familiar pioneer novels, where hostile alien intelligence—like hostile planetary terrain—is encountered and confronted, and then subdued by the human will. Then there are the stories of human arrogance, human overreach, and the inevitable backlash (Embassytown ). A popular tributary of this stream—from Solaris (1961) to Colony (2017)—mixes together environmental SF and first contact: human attempts to study or colonise other worlds are thwarted by a planetary sentience, often with devastating effect. One recurring theme underlying the subgenre—but especially this latter set of stories—is pessimism about the possibility of comprehension. In his review of the film based upon his book, Stanislaw Lem, the author of Solaris, wrote that “[Solaris] neither built nor created anything translatable into our language that could have been 'explained in translation' ... [it] cannot be reduced to human concepts, ideas, or images.” The attempt to do so—whether motivated by space-age Orientalist desires of exercising power through knowledge, or by more benign impulses—is doomed to failure. Ironically, this fundamental “otherness” of alien intelligence is confirmed even on the rare occasion that comprehension is successful: for example, in Ted Chiang’s “The Story of Your Life” (adapted into the film Arrival), decoding alien intelligence overturns some of the organising principles of the world, such as causality and the linear flow of time. 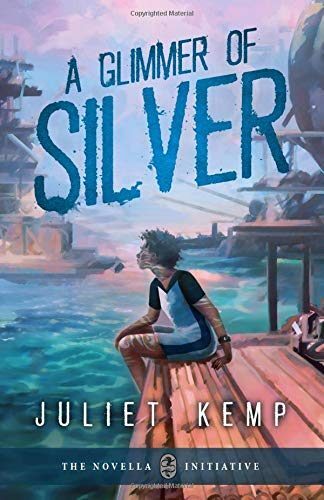 Juliet Kemp’s 2018 novella, A Glimmer of Silver, represents a more optimistic—yet equally nuanced—treatment of a time after first contact. The premise is—at first—reminiscent of Solaris: human beings arrive upon a planet that is entirely Ocean, and begin to colonise it. In a few years, they discover that Ocean is sentient, and has begun to react to their presence, sometimes violently. The colonisers interpret this as Ocean’s anger at them “stealing chunks” (p. 19) of it away, and respond quickly. They retreat to small, self-sustaining bamboo “islands” and establish a “contract” with Ocean, according to the terms of which human society will continue to subsist on Ocean’s surface, but independently of it: human beings shall not interfere with Ocean’s ecosystem, or attempt to “study” it. The contract is interpreted by a set of people called “the Communicators”, who alone are physiologically able to drink Ocean’s waters, and who can thereby mentally “talk” to Ocean, and transmit Ocean’s requirements to the community. Having successfully drunk a beaker of Ocean-water on xyr twelfth birthday, Jennery is one of those selected to become a Communicator. This, however, is the last thing that xe wants, as it would mean giving up xyr passion for music. According to the rules, Jennery must now wait four years to let Ocean “speak” to xyr, and if that doesn’t happen, xe will not be made a Communicator, and can return to the community. Two days before this period is due to end, however, Jennery’s hopes are dashed: the Ocean does speak to xyr, and xe learns that there has been a serious breach of the Contract: somewhere, people are eating Ocean’s fish. Seized with terror at the prospect of Ocean rising up and wiping them off the face of the planet, the Communicators promptly constitute an expeditionary force to bring the perpetrators to justice. But as they set out on the Ocean, Jennery increasingly begins to feel that it is not the mysterious fish-eaters, but human society as a whole who have come to misunderstand the Contract, and are causing Ocean’s upheavals. The future of humanity on Ocean now depends on Jennery’s ability to convince the Communicators that they have misunderstood Ocean and misinterpreted the contract, before it’s too late. A Glimmer of Silver subverts some of the basic tropes of the first contact tradition. Here is a human colony that takes its responsibility as a guest with punctilious seriousness. Non-interference has been raised to a sacred principle, to the extent that even scientific study of Ocean is prohibited. And that responsibility is so culturally ingrained that when Jennery is resentfully asked “Why does Ocean get to call the shots?”, xyr response is instantaneous: “Well, because Ocean was here first ... We shouldn’t be here at all when it comes to it, right?” (p. 46) It is a response that seems intuitively correct, and with which every colonized community would presumably agree; but it is a response that, A Glimmer of Silver suggests, may sometimes serve to block the progress of a mutual relationship, rather than enable it. In that latter respect, however, A Glimmer of Silver reiterates the warnings of its predecessors. Having established the Contract, the Communicators are convinced that it is an accurate interpretation of Ocean’s wishes: Ocean has reacted to human attempts to colonise it, and so, the only message that it must be sending is a message of separation. The thought that Ocean may want something in between colonisation and separation - a “joining of two worlds” (p. 81)—does not even cross their minds. The central conflicts of A Glimmer of Silver arise out of Jennery’s attempts to persuade the Communicators that a century-old way of doing things should be reconsidered, and the Communicators’ resistance to upsetting this settled pattern of life. Paradoxically, it is this acknowledgment of the possibility of error—born out of the acknowledgment that it is nothing more than the human mind that needs to mediate between incommensurable intelligences—that allows Jennery to listen, to understand, and to interpret Ocean’s messages more accurately than a century of professional Communicators. And paradoxically, it is easier for Jennery to communicate with the sentient Ocean, rather than with xyr fellow human beings, who are locked in the shadows of their own minds. A Glimmer of Silver reminds us that, sometimes, the most potent barriers exist not between species, but between ourselves. But in its insistence that these barriers are not insurmountable, it speaks to the possibilities—and the hopes—of translation and coexistence, at the meeting points of sentience.